Neil Turnbull carved the contours of this dry garden with a fire hose. 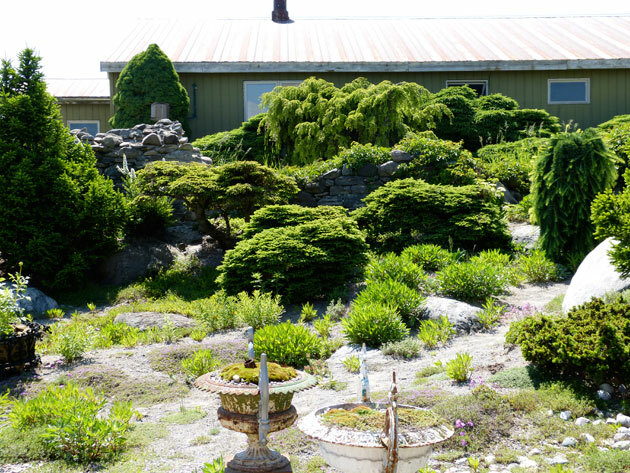 Landscape architect Neil Turnbull’s farm has taken root. It feels as though I’m time travelling. Rain threatens as Neil Turnbull pilots the golf cart over the bumpy lanes and through the fields of Hedgerow Farm, near Sunderland, Ont. Where cattle once roamed and fields grew grain, tiny twigs have gradually grown to magnificent trees or bushy shrubs over the past quarter century. Artful placement has turned boring vistas into painterly, eye-pleasing compositions. “When we got this place [in 1987], it was pretty exposed. It was a worn-out farm,” he says. A tornado had destroyed the barn, piggery, drive shed and most of the sugar bush in 1957 and a Quonset hut built on the barn’s foundation burned in 1972. Turnbull, a landscape designer with well-heeled clients in the Toronto area wanted to grow things – especially large, hard-to-buy, unusual trees. Through the years, he’s re-shaped parts of the farm’s land, dug ponds and even created a new headwater for the Beaver River. Turnbull and his wife had looked at 15 or 20 properties. “We didn’t see anything that really had a zing to it,” he recalls. The farm had been taken off the market, but a rusty For Sale sign had tempted them up the driveway. Fields once scoured by glaciers sloped away, offering a view – and plenty of wind. Turnbull had pulled a spade from his trunk and dug to assess soil conditions. It was deep and very mixed – perfect for growing a range of trees. “That’s why we can grow all these oddball things here,” he says. We stop to check the flock of ducks in the main pond. Come fall, they’ll become dinner. In the meantime, their manure makes the irrigation pond a rich source of plant nutrients. “They quack all night. We came back last night and it was like a mad party going on,” he laughs. There’s an unconnected pond, a natural swimming pool kept open all winter for the benefit of watering wildlife. It requires no chemicals to maintain the water’s purity as a result of water flow and cleaning power of its plants. Its water flows down a stream and a pump sends it back to the head of the pond. 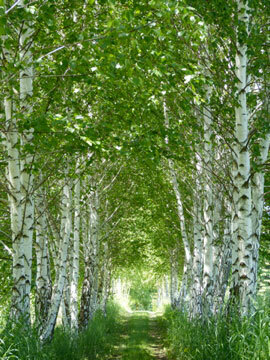 He slows the golf cart at the entrance to a magical allée of European birches and points out a horizontal row of holes. “That’s made by a yellow-bellied sapsucker,” he says. He points out Bill Lishman’s ultralight landing strip. (Lishman, a renowned sculptor, inspired the movie Fly Away Home, after teaching geese to follow his ultralight in an experiment aimed at teaching birds to learn unfamiliar migration routes.) Above a four-acre field holding two heritage collections of peonies looms a two-storey-high Lishman wire sculpture of an extinct native dog. Tahltan bear dogs were small but fearless. In it, a wren perches, surveying the peonies. Growing plants for landscaping is much like farming anything else, except that when you grow trees, you have to take a long view. Some trees, black walnuts, butternuts, red oak, have grown too large to move and will eventually be harvested. “We’re not going to benefit from the lumber, but someone will,” Turnbull says. To nourish trees and shrubs, fields are ploughed and planted with a cover crop of fall rye, or buckwheat, which is ploughed in to enrich the soil. After a few cycles, trees are planted, along with a ground cover that captures atmospheric nitrogen that feeds them. It’s a continuous process. As we bump along, hoping to outrun the rain, he points to an amazing inventory of trees: silver fir (crush its soft needles and you’ll smell grapefruit), pyramidal cedars trimmed to look like the cypress of Italy that can’t survive here, native catalpa, dawn redwood – thought to have been extinct for five million years until specimens were found in China in the 1940s. “To make gardens look mature and rich, you need some really strong statements,” he’d said. These ought to do it, I think to myself. Finally we head for the gallery, built on the site of the original barn. Just outside it, he laughs as he tells me how he used a fire hose to sculpt a xeriscape garden (it requires no watering) in the old foundation. Everything but the round windows is recycled. 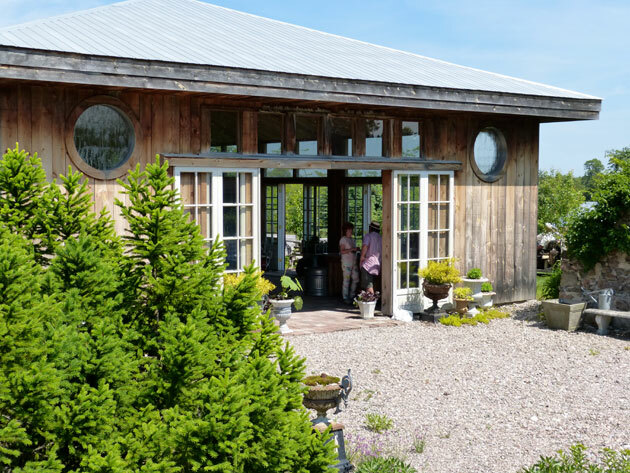 It’s a fun space that’s been the scene of fundraisers for environmental causes and birthday parties and the base for forays to the fields on Peony Daze, when friends are invited to enjoy the sight and scent of the lovely flowers and fill up on homemade French fries. The stock on this farm doesn’t have four legs; there are no prize-winning cattle grazing its fields. But the textures and shapes of the trees Turnbull has planted along the driveway draw my admiring eye. The effect is natural, beautiful. All it took was a landscape artist’s knowledge and passion – and a little time.